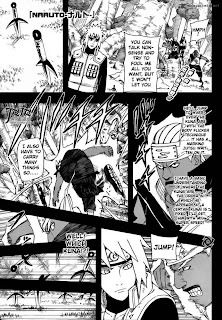 Eventhough this chapter is started with the battle between Minato and Raikage in the past, but its only to make clear and showing of Bee's talent. If you don't read carefully step by step, I wonder if you'll get conclusion of this chapter. The outline story show us about how hard Naruto try to escape from Raikage's speed in order to go to the battlefield. Bee also help Naruto and try to defeat his brother with Lariat but Raikage still didn't understand with Bee's action and the reason why he is trying to help Naruto. And when Raikage ask some help from Hokage, its only get the opposite result. Tsunade sama decide to let Naruto pass, she believes in Naruto's power and back to her old self just like when the Akatsuki attacked Hidden Leaf Village. And thanks to Bee, by using Lariat move which Raikage is so proud of him self, Bee defeat his brother. He is trying to say that he and Naruto aren't just about Jinchuuriki power but the real strength comes from their own bodies. Its all about the words that can't be discarded which he get from Raikage. What was the special word that Killer Bee talk about?